Last Sunday was the closing show of the Bay Area Children's Theater's adaptation of RICKSHAW GIRL. I was sad to bid farewell to the cast and crew, but the memories of their artistry bringing my story to life will uplift and sustain me for years to come. My thanks to one and all, with deep gratitude for this marvelous privilege. I know it's a once-in-a-lifetime experience for a writer. 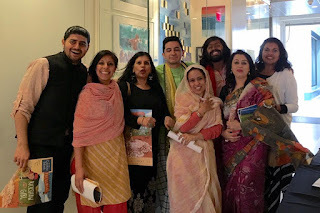 From left to right: Amit Sharma (Cast/Tabla), Emily Alvarado (Naima), Director Vidhu Singh, Salim Razawi (Saleem), Ariel Irula (Mother), Pankaj Jha (Father), Sonali Bhattacharya (Music), and me. Missing: too many to list, but I must mention Radhika Rao (Rashida/Rickshaw Painter) and Aditi Kapil (Playwright). Meeting an author is kind of scary. I found a Facebook status written by someone I didn't know who took her daughter to the show. Her words were encouraging as my friends and family can't really be trusted for an impartial response. 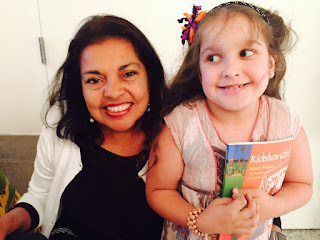 "Was amazed today at Bay Area Children's Theatre's production of RICKSHAW GIRL. I think it was my absolute favorite show of the season which is hard to say when I loved them all! We had not read the book before and didn't know the story so it was beautiful to discover such a treasure! It was so nice to see Holly engaged with a story so unfamiliar, and we loved the Bangla songs and the Tabla music! We were lucky to be blessed to meet the author of the book who was in attendance at this final Berkeley performance ... We are looking forward to next season already!"